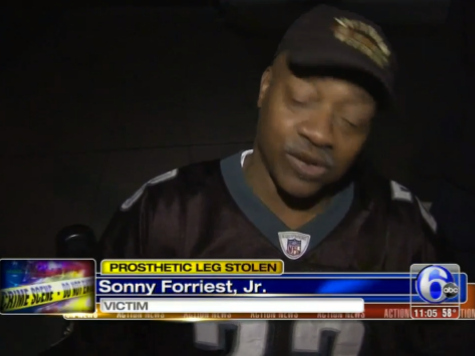 The growing list of fans being abused at sports stadiums has another member: a well-known Philadelphia military veteran who sings from his wheelchair outside Lincoln Financial Field had his prosthetic leg stolen. Sonny Forriest Jr. was singing in the parking lot of the stadium Sunday night around 8:30 when a twentyish woman who was supposedly drunk and wearing Eagles apparel leaped into his lap, breaking his microphone. 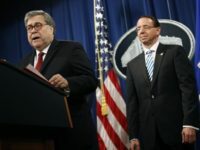 Forriest recalled, “She said, ‘I will pay you for it.’ I said, ‘That’s alright baby go ahead and have a good time,’ and then she disappeared.” She suddenly took off, running through the parked cars with the prosthetic leg he had left on the side of his wheelchair. Forriest said he occasionally removes the leg when it bothers him. Later on Sunday night, around midnight, SEPTA police on a subway train found the leg. Forriest says the police informed him that surveillance video of the woman exists. He added that the suspect should not be jailed, simply educated as to the consequences of her actions. No one has yet been arrested. The bad behavior in Philly follows a series of high-profile, low-class incidents. On October 3, after the second game of the Angels-Royals ALDS series at Angel Stadium of Anaheim, a 43-year-old former member of the Los Angeles Police Department who was off-duty was brutally beaten by another attendee at the game in the parking lot. He was left in critical condition. Two days later, on October 5, Amador Anguiano Rebellero and his brother Dario Rebellero allegedly assaulted two men in a urinal at Levi’s Stadium in Santa Clara; one victim was left paralyzed and had part of his skull removed. The Rebelleros have been arraigned on felony assault charges.